Are you getting enough omega-3’s for a healthy heart and brain? Probably not, most people need more omega -3 fatty acids in their diet. The American Heart Association recommends eating two servings of fatty fish per week. One serving is 3 1/2 ounces cooked or about ¾ cup of flaked fish. Here’s an easy lunch or dinner packed with omega-3’s and beans! Yes, that’s right Paleo lovers -beans in the form of hummus! Beans are a super food that have numerous health benefits and are a healthy part of your diet! This recipe was a hit with both kids and guys. Spread hummus on toast. 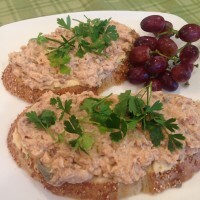 Top open face sandwich with salmon mayo mixture. Top with fresh parsley. Eat and enjoy!